Last week I posed the question “What is wrong with this kettlebell swing?“, this week I will show you what was wrong. If you got the answer right, great! If you were one of the people that wrote a long list of things that were wrong, I don’t blame you, it’s all good, sometimes it takes a while to open the mind to new things and understand that there is more than one way to skin a cat, and a million ways to swing a kettlebell. As long as what you do reaches YOUR goal, is safe and is correctly named, then who is to say you’re doing it wrong? Move or cause to move in a smooth, curving line. Don’t confuse the swing with pendulum which is what we talk about with the hip hinge style swing to get the idea of arms not powering the swing across, the mention is to get a concept across, the movement is not actually a pendulum. Even the kettlebell exercise around the body is a swing of the kettlebell. 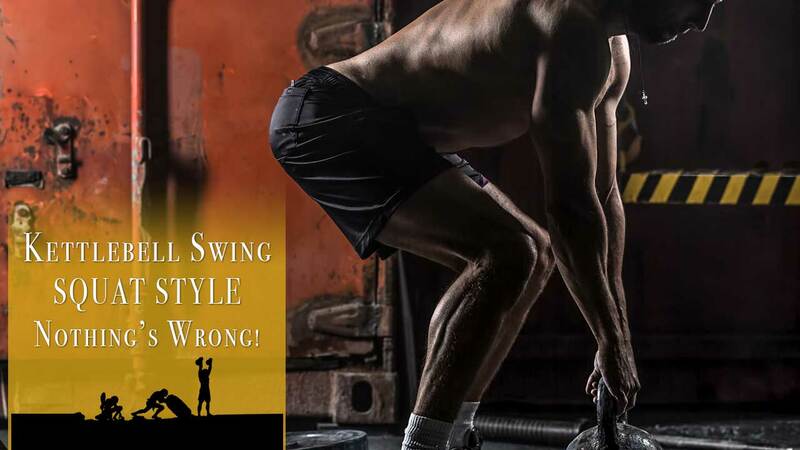 Stop listening like a zombie to those who say “A kettlebell swing is a hip hinge”, yes a “Russian swing”, “Convention double-arm swing” is a hip hinge, but as for A kettlebell swing, you can do it 25 different ways. I’m just pulling that number out of the air. Squat style for anterior chain muscles, hip hinge style for posterior chain muscles, end of story, go swing a kettlebell!